Strange events are preparing as a world very different from yours begins to emerge in reality. Many dreamers are chased by nightmares of ink darkness that glide silently through the heavens. Others sink gently into a deep sleep from which they will never wake up. The fabric of reality and reason is torn quickly in many places. Supported by a handful of brave souls, you are the only rampart between humanity and the infinite emptiness. The Dreamlands expansion features the additional Dreamlands platter, opening up strange portals that lead from the world of awakening to the land of dreams. Eight new intrepid investigators join the ranks of the heroes who will defend the world against ever greater danger, and are accompanied by Allies as faithful as the enigmatic Randolph Carter. Use mind-blowing Spells, mind-blowing Talents, and unreal Artifacts to stand up to the power of the Great Old Ones. Go down the steps of sleep to the Enchanted Wood, and enter the fantastic kingdom of the Dreamlands! Be careful this game is an extension of Les Contrées de l'Horreur and cannot be played alone. 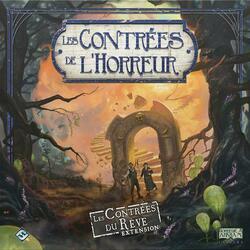 To be able to play it you must have a copy of the game Les Contrées de l'Horreur .